Korean manufacturer hopes to improve its products by collecting concepts from consumers. 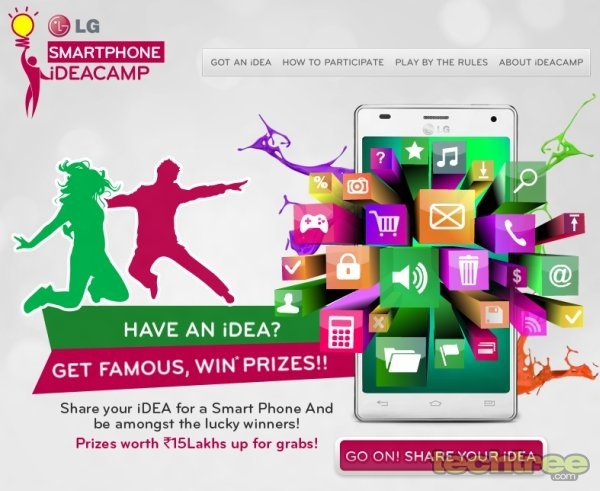 LG has kickstarted an interesting online contest, called the Smartphone iDEACAMP. In order to participate, users are required to suggest a feature, UI element, app, design, or even a service that they wish to see in smartphones. These entries will then be evaluated by company officials, and winners will receive prizes worth Rs 15,00,000. The best submission will win the top prize of Rs 3,50,000, while the first and second runner-ups will be awarded Rs 2,00,000 and Rs 1,00,000 respectively. Seven other consolation winners will receive a cash prize of Rs 50,000 each, taking the total prize money to Rs 10,00,000. The remaining Rs 5,00,000 comprises of Optimus smartphones (most likely the Optimus Hub), given away to the top 40 ideas. According to LG, it has held the contest to understand what its consumers want from their phones. Entries are open, so head on over to the contest page and give it a shot. Since there's no way to modify or update your entries, make sure you review your idea before hitting the Submit button. The contest ends on 15th September, and is open only to Indian citizens. Once deadline has passed, the 40 best ideas will be chosen to make it into "Phase 2", wherein a workshop will be held over three days at the LG India HQ in Delhi. During this period, participants will have to present their idea in detail to a panel of judges, which will be followed by discussions to determine the concept's viability. Based on this, the top 10 winners will be selected. Therefore, if you've had what you think is a great idea for a phone, but didn't know whom to discuss it with, here's your chance to shine. Good hunting!